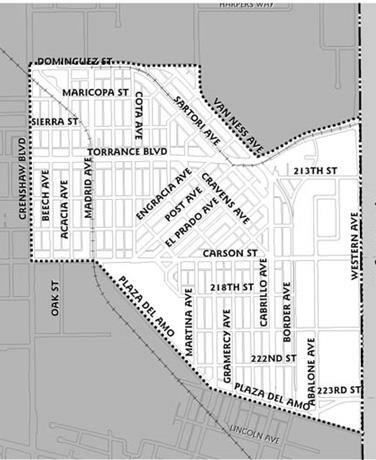 The Old Torrance Neighborhood Association (OTNA) was founded in 1981, and is known as a "Neighborhood Association" rather than a "Homeowners Association," as there are many apartment buildings and rentals within our boundaries - we don't want to exclude anyone. The original boundaries of OTNA were Crenshaw Blvd. to Western, and Dominguez to Plaza Del Amo. This is the original set of boundaries for the Town of Torrance, as designed by the "OLMSTED BROTHERS, LANDSCAPE ARCHITECTS, BROOKLINE, MASS." of Frederick Law Olmsted fame. As noted in the OTNA meeting minutes of November 16, 1994, it was proposed that OTNA join forces with Kettler Knolls, the area beyond Plaza Del Amo to Sepulveda, by annexing them into the group. This issue was voted on by the membership at January 4th, 1995 meeting. The vote to officially extend the OTNA borders to Sepulveda, in order to incorporate Kettler Knolls, was unanimous. For additional information about us and our mission please visit our Mission page. To request additional information, please visit our Contact Us page.